when a nearby smoke detector alarm goes off, the LinearStrobe™ goes into action to highlight the outer edges of your doorway. Every few seconds, the LinearStrobe™ takes a sample of the sounds in its area and processes those sounds through its mini-computer. If these sampled sounds include the specific smoke alarm sounds (frequencies) that it is trained to recognize (like that which a typical common smoke alarm broadcasts), the LinearStrobe™ hears it and automatically goes to work to highlight the universally recognized shape of a doorway. It works 24-7-365; constantly searching the airwaves near it for alarms sounds. The LinearStrobe™ is designed to operate as a voluntary stand-alone home/building accessory consumer product to provide buildings (residential and commercial, alike) with an ever-present inconspicuous bright lighting system to identify and highlight the universally recognized shape of a safe exit door and to communicate where that door is located when other alarms in such building are activated. The LinearStrobe™ runs on a 9-volt battery. It is constantly listening for the sound of a smoke detector. When it hears a smoke detector go off, the LinearStrobe™ turns on. 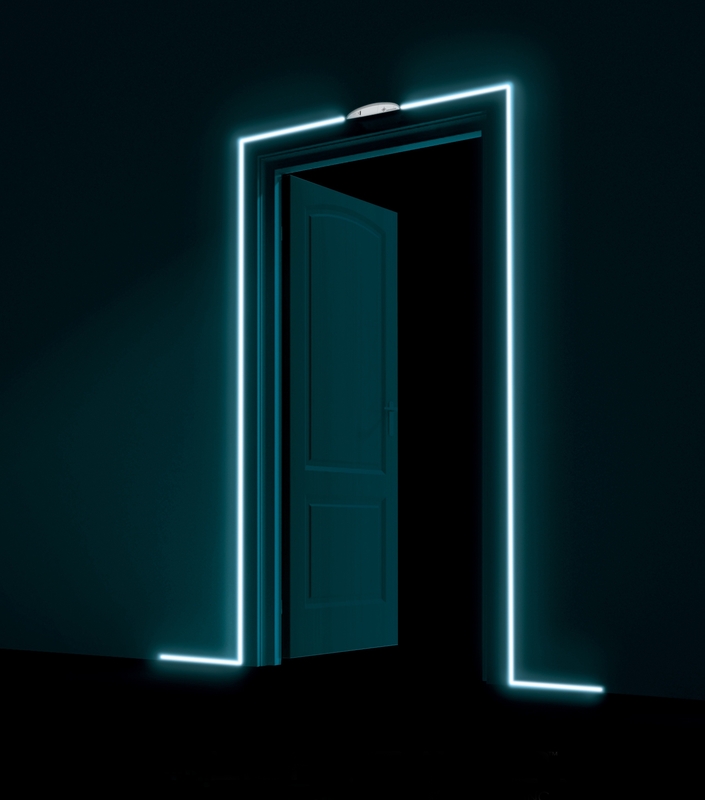 When triggered, the LinearStrobe™ clearly outlines the door and floor areas so one can escape quickly. LinearStrobe™ devices are available in, both, single-station – home and system integrated – commercial forms. Either form provides the means of alerting occupants to the existence of an emergency condition, brightly demarking an exit or egress path and, directing occupants to the exits utilizing a flashing linear luminary.